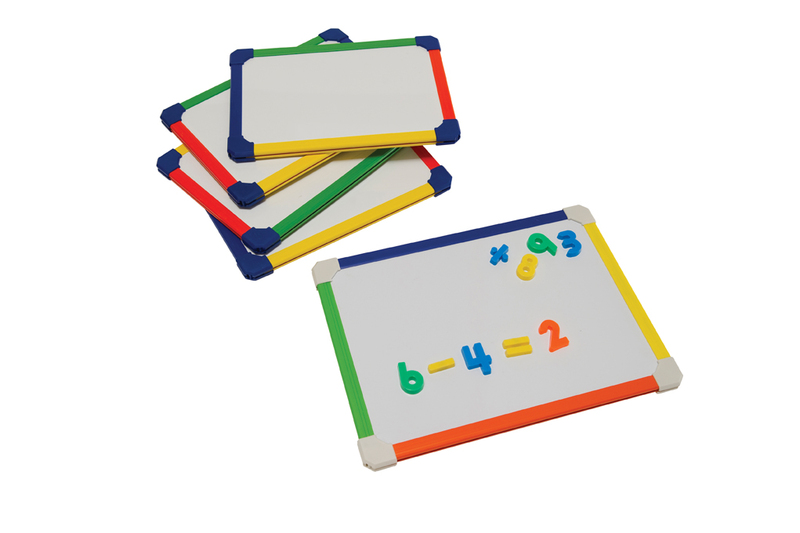 This pack of 5 rainbow framed sturdy, drywipe lapboards is ideal for group working activities in both primary and secondary schools. Lapboards are a great tool for getting students involved with work in an interactive way and provide a fun alternative to pen and paper. The unique A3 size of these mini whiteboards are perfect for more vocational subjects like art and design. The size of these lapboards mean drawing diagrams and illustrations is made simple and can be easily changed or erased without any mess. Alternatively, the A3 lapboards are ideal for group work in lessons, for example, brain storming activities. Made from recycled material, this pack of mini-whiteboards helps to reduce paper wastage in schools as the dry wipe surface means they can be used time and time again. These lapboards are environmentally friendly whilst remaining fun and colourful to encourage students’ engagement in activities. Using lapboards in lessons allows teachers to visually gauge an idea of students’ understanding of a topic in a quick and effective way, and determine which students may need additional help. Mini-whiteboards are a great medium for involving less confident students to actively put forward their ideas amongst peers without the fear of getting something wrong. The dry wipe easy-clean surface allows students to alter work without any mess until it is correct. The rainbow coloured frame is manufactured from ABS plastic which makes them durable and able to withstand daily classroom usage. Mini-whiteboards are portable and are ideal for outdoor lessons or group work which requires students to be on the move. Choose from magnetic or non-magnetic surfaces. Chose the non-magnetic surface option for a fun alternative to pen and paper or the magnetic option if you want to use magnetic accessories for further engagement.